Posted on 27/04/2015 by Ian Grove-Stephensen Tagged analysiscriterion-referenced assessmentdatagradeschememichael govenational curriculumnc levels	CommentsNo Comments on Are teachers abandoning NC Levels? Research shows the exact opposite. Are teachers abandoning NC Levels? Research shows the exact opposite. One of the great things about running a really big database like Yacapaca is that you get an absolute ton of data to analyse, and you can sometimes give definitive answers to questions other people can only speculate about. The ‘disapplication’ of NC Levels is a case in point. Michael Gove told teachers to abandon NC Levels last September. As it happens, we keep a detailed log of the gradescheme applied to each student set within Yacapaca. 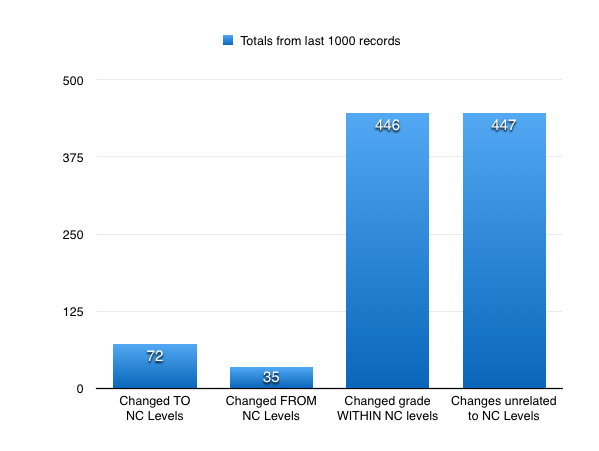 This morning, I grabbed the last 1000 changes to existing gradeschemes, and ran the numbers.